MechPro Inc’s reputation as a professional and competent heat exchanger service provider is recognized throughout the industry for our quick turn around time, competitive prices and excellent workmanship. Our service and repair staff has more than 100 years of combined experience inspecting, diagnosing and repairing all types of heat exchangers. 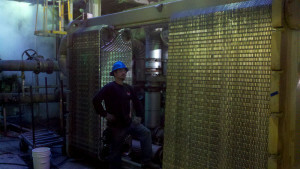 MechPro Inc. has the right people and right tools to quickly solve your heat exchanger problems on time and on budget. 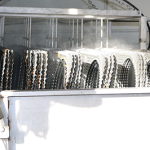 We service ALL makes and models of Tube and Shell and Plate Heat Exchangers. 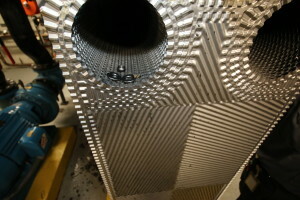 Essentially every part of your heat exchanger can repaired or replaced on an as needed basis. Major heat exchanger parts include plates, gaskets, shell replacement, channels, channel covers, tubes, tube sheets, baffles, tie-rods and spacers, seal strips, as well as any other necessary parts. To minimize downtime risk all parts supplied by MechPro Inc. are thoroughly tested before being shipped to our customers. 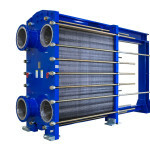 Plate Heat Exchangers (PHE) are heat transferring devices used to move heat from one liquid substance to another for the purpose of either heating or cooling a substance for another process. Plate Heat Exchangers are constructed with a series of thermally conductive plates which are used to transfer heat from water to water, air to air, water to air or steam to other liquids, essentially heating one substance while cooling another. Many of MechPro’s customers use industrial cooling processes that require plate heat exchangers to perform critical roles in the design, operation and maintenance of heating systems, air-conditioning systems, power generation, refrigeration, chemical processing, food processing, marine engine cooling, offshore oil rigs and engineering systems. MechPro provides 24/7 onsite cleaning, maintenance and nationwide emergency repair services for heat exchangers to ensure optimal up-time and efficiency for these critical industrial cooling processes. Heat exchangers are also used in the process of waste heat recovery in industrial facilities to capture excess heat from one industrial process and use it in another process which requires heat. Power generating facilities rely on heat exchangers to keep processes from overheating as well as to recycle and process waste heat. 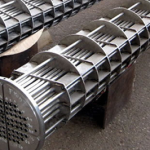 Heat Exchangers are used in a wide range of industries which include: chemical, marine, petrochemical, automotive, food processing, pharmaceutical, electronic, and semiconductor. Examples of industrial processes which utilize heat exchangers are found in water treatment, paper and pulp mills, as well as steel manufacturing. Heat exchangers MechPro services are typically constructed from duratble, corrosion-resistant materials such as steel, titianium, copper, bronze, stainless steel and aluminum with stainless steel being the most common since it is the most durable and can withstand both high pressures and high temperatures while efficiently acting as a heat conductor. The two most common designs are the flat plate design and shell and tube designs in which internal metal surfaces act as thermal conductors while keeping fluids from mixing.